AN UNFORGETABLE EXPERIENCE OF CONSUMING vodka. in the Mexican market with the launch of the Copper Catalyst. By allowing consumers translate an intimate, introspective ritual such as preparing yourself a tea to a nocturnal context by personalizing a luxury vodka with selected tea, the Copper Catalyst results in a smart and beautiful tool for an unforgettable experience of consuming Absolut. For the brand to provide a unique experience to the consumer it is necesarry that the design team understands the brand to perfection; from the color palette to the filosofy of the brand, this way the design is driven from it's brand identity. It is also important to know who the consumer is and who the brand is to make a fit, resulting in a WOW product that represents the brand and the consumer loves. Absolut Elyx is the world’s first true luxury vodka. Their product is masterfully-handcrafted inside Copper stills by a family-owned farm on the Råbelöf Estate in Sweden resulting in a silk like vodka with tones of wheat. Absolut guides every step of the production of Elyx, assuring the quality and integrity of the product, creating an unforgettable drink and with it memorable experiences. Its all about empathy, people respond to emotional connection so C37 discovered that the target market of Absolut Elyx in México can be clustered and better described as "The Urban Maven" based on its lifestyle. One that is an eternal trend maker & seeker, elegance for them has to do with authenticity and attitude rather than possesions. They are intelectually, emotionally & culturally centered pursuing as a personal legacy to catalyze a change in their immediate circle by staying in a constant state of mind of evolution by learning of experts. This insights where obtained after several ethnographic tools applied and developed specially for this project such as cultural probe, image sorting, social media research, and ethnographic interviews to better understand the consumer’s motivations, wants and needs. This information was translated as guides for the aesthetic and experience of the potential product. The Urban Mavens tend to incline for clean, polygonal and geometrical shapes. They love the simpiicity and honesty of raw materials & seek for constant experiences that can be shared. All of this inspired an experience that inspired the pyramid design and collective experience of The Copper Catalyst. Based on the consumer segment of Absolut Elyx brandboard, C37 developed a moodboard that translated all the relevant touchpoints for the project by defining materiales, forms, experience & aesthetics resulting in a beautiful product that connects with the consumer. To provide a Raw Luxury experience (like the brand asked for) the materials choosen where volcanic stone and polished copper. Through the process of exploration of forms and testing is what transformed the design of The Copper Catalyst into a unique experience. Sketching, scaling, building sketch models and rendering helped C37 develop a product that gives the Urban Maven an experience that is ergonmic, functional attractive, and unforgetable communicating the most relevant values of Absolut Elyx. C37 teamed up with experts on different areas to make The Copper Catalyst concept, tangible. The multidisciplinary team was conformed of experts in the industrial design , mixology, steel arts and manufacturing areas. The product is a result of artisan and automated manufacturing. The infusers are precisely cut with laser cutting from a sheet of metal and then individually folded, welded and polished by hand. The packaging is made of MAGMA 04, a material developed for this project to resembles the basalt stone, but stronger and lighter than the original material so it can be placed effectively in bars and tables. Aiming to design an unforgettable experience of consuming Absolut Elyx, The Copper Catalyst is a set of tea infusers that allow scents and colors of the natural leaves of tea to escape and merge slowly with the translucid vodka by balancing the drink, replicating the ever calming ritual of preparing a tea for yourself but in a nightlife context that can be shared by decorating your martini cup. The Copper Catalyst includes a set of 4 individual copper infusers with a shape of pyramid that together form a cube, resting in a MAGMA pedestal, allowing consumers personalize their cocktail while sharing the experience, resulting in a smart and beautiful tool for enjoying vodka. The Copper Catalyst comes in a package made from a material from our Material Lab called MAGMA. This material was discovered after experimenting with polymer and other compounds, giving the resistance needed for living in a bar and the aesthetic needed to give a raw-luxury experience. The Copper Catalyst benefits from its separate infusers, giving the opportunity for people to share the experience while highlighting individually by giving the chance to individually personalize each drink. Unlike other alcohol tools, The Copper Catalyst is an object that infuses vodka in a smart way while giving the consumer a beautiful experience to share. After months of investigating the consumer, designing, and testing results in the design of The Copper Catalyst. Since launching in 2015, The Copper Catalyst has positioned the brand in the mexican market and has been awarded for its outstanding product design. The Copper Catalyst is launched in the Abierto Mexicano de Diseño after 9 months of continuous refinement and prototyping. The Copper Catalyst wins an a! diseño award for best product of the year. 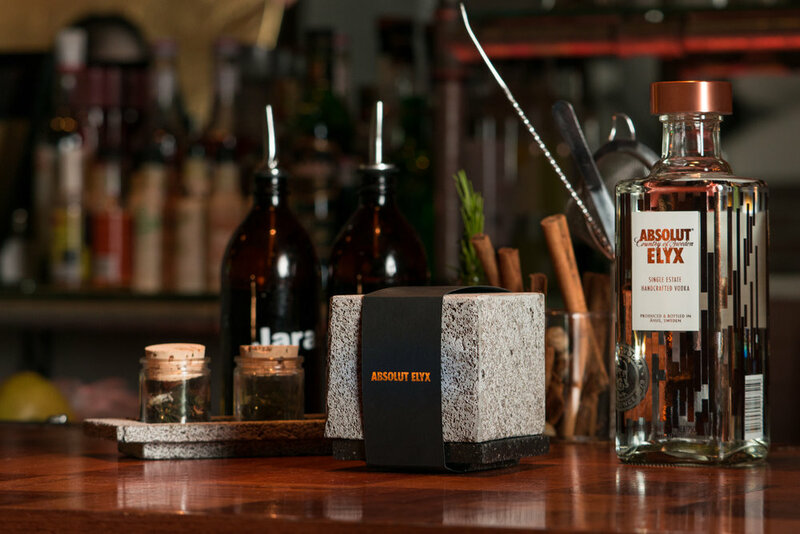 Absolut Elyx launches The Copper Catalyst in bars around Mexico.